I love coffee. Really good coffee. One night after geeking out about coffee preparation with my friend Khrista, I went searching for a reputable local roaster. I asked my Facebook friends what their favorite Boulder-based roaster was. And while I did get a few answers...the BEST answer I received was from another friend, Pucky. He suggested that I could ROAST COFFEE BEANS MYSELF! I don't know why it never dawned on me to learn and experiment with it before. It always just seemed too difficult. He graciously bought me 5 lbs of green beans and had them shipped to my door. I've never looked back! 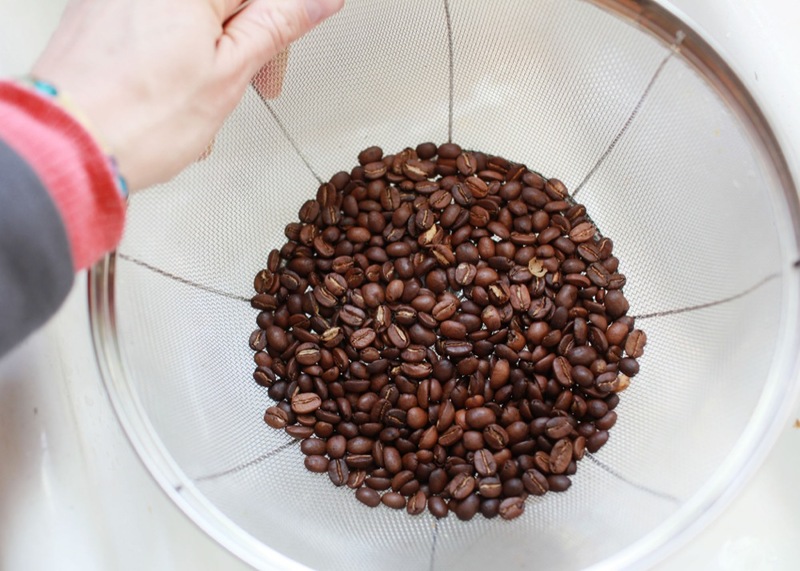 Getting started with roasting your own beans is so EASY. All you need is an air popper and a strainer. Now...it can't just be any 'ol air popper. The Poppery II from West Bend is widely known to be one that works great for air popper roasting. The Air Crazy is another that has been tested and works. You can find the Air Crazy here. The Poppery II is a little harder to find, as they don't make it anymore. I found mine on eBay, but you might be able to snag one at your local thrift store if you keep an eye out. I would eventually love to bump up to a "real" coffee roaster...one that roasts more than 1/4 cup of green beans at a time. But for now, this works great! If you have a popper at home, you can try that too, but it MUST look like the photo on the right with the air vents that spin the beans around. Not the mesh bottom. The air vents on the right will spin the coffee while it heats, which is what you want. Here is a link to Sweet Maria's that details everything you ever wanted to know about the air pop/roasting method...including all the different models you could use. Because this lovely chaff will start shooting out immediately and will continue on through the entire roasting. There will also be a nice aroma...and sometimes "smoke" that fills the air. All the books call it "smoke"...but it's more like a light fog :) that increases with the length of time you are roasting. If you have a vent or window to open, it's helpful...but I have even been roasting in the RV with no problems. Every type/origin of bean will roast differently...and that's the fun part! My favorite bean so far has been organic/fair trade Columbian, with Organic Bali Blue Moon coming in at a close second. They both handle heat well and can be roasted dark. I've tried a couple that seemed to burn quick and not roast evenly. I roast my Columbian for 12-13 minutes. Next, I pour the beans into a wire/mesh strainer and spin them until they are warm to the touch and not burning your hand. At this point, I inspect the beans and pull out any that did not roast fully or have anything funky going on. Then I let them "rest" for at least an hour before brewing. 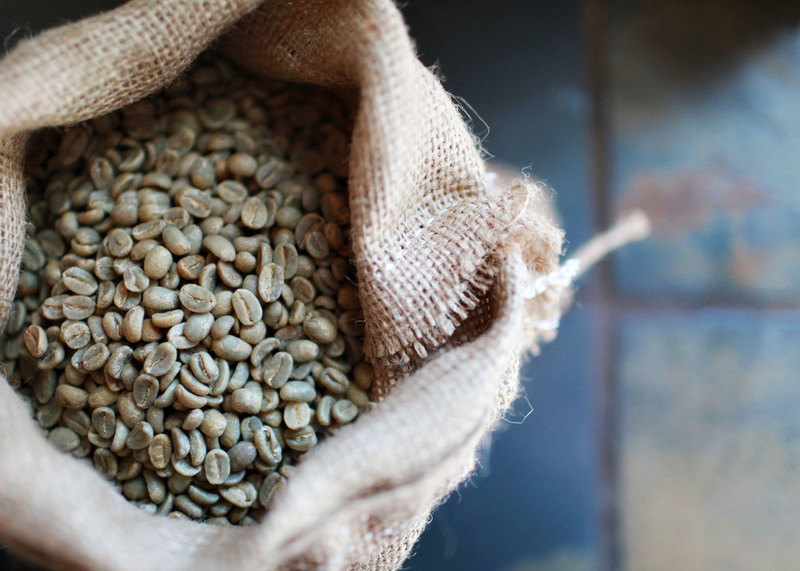 Coffee is at it's most flavorful 4 to 24 hours after roasting. Which is precisely why if you enjoy coffee, you should roast your own. Even the coffee you can get from your local roaster will most likely be at least 24 hours old. In some cases, the beans you are buying are MONTHS old (or more...gasp!). I store my beans in a re-purposed steel coffee tin...but you could use anything with a tight lid. 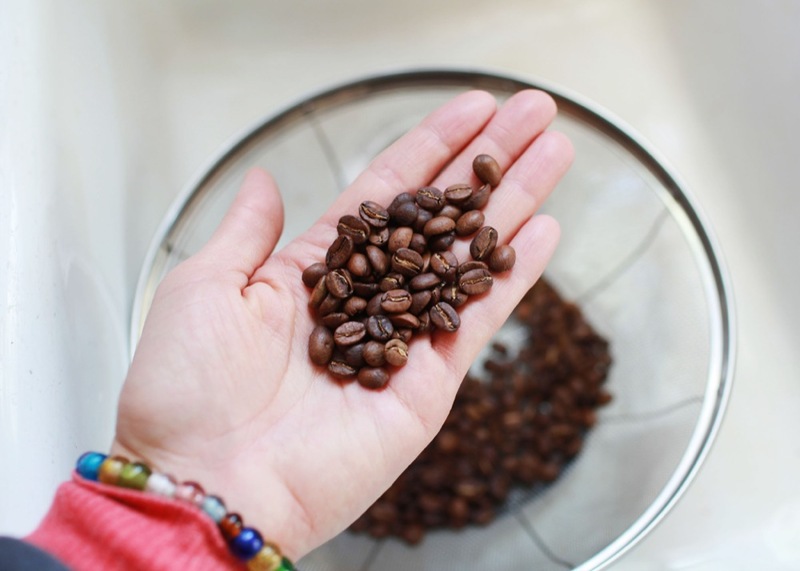 Here are some great coffee storage tips. Now...for the grinding! I am currently using a blade grinder, but have plans to be using this beauty soon!! My Dad used this all through my childhood and he recently gave it to me. It's an antique Arcade Crystal hand crank burr grinder! The screw is broken and I need to get it replaced, but I am SO thrilled to have this amazing piece in my home. There are so many grinders out there to choose from. If I didn't have the Arcade, I might be getting this one. Or, even better, this one. The grinding style really does affect the taste of your coffee...so choose wisely! My favorite method of brewing is the Aeropress. It quickly and efficiently makes espresso shots...with minimal mess! I've used it for several years without fail. There are MANY different methods of brewing with the Aeropress. In fact, there are even Aeropress World Championships where coffee aficionados compete with their own tweaked Aeropress style. There is even an iPhone app! It has a lot of different ways to brew. Personally, I've been using a variation on "The Jay" (iPhone app version). I grind it to an espresso grind (fairly fine)...and dump it into the canister, with the plunger at about 4. Much of the time, I use a Hario kettle because I love that I can pour it reeeeeeeally slow and controlled (which is great for making Chemex coffee, but that's a topic for an entirely different blog post!). Other times, I use my regular electric kettle. After the water comes to a boil, I let it sit with the lid off for a few minutes to bring the temp down to 175-185 degrees. I then pour in just a little bit of water to allow the beans to "bloom" a bit. Then I pour it to the top and stir for about 10 seconds. I then replace the lid with a rinsed paper filter and screw it on tight. I let it sit for approximately 2 minutes and then I invert it over my cup and press slowly for 20 seconds. You can make a latte! I like to add a little foo foo to my espresso...and my handy dandy Nespresso Aeroccino has become my BFF in that area. It makes heated, frothed milk with the touch of a button. 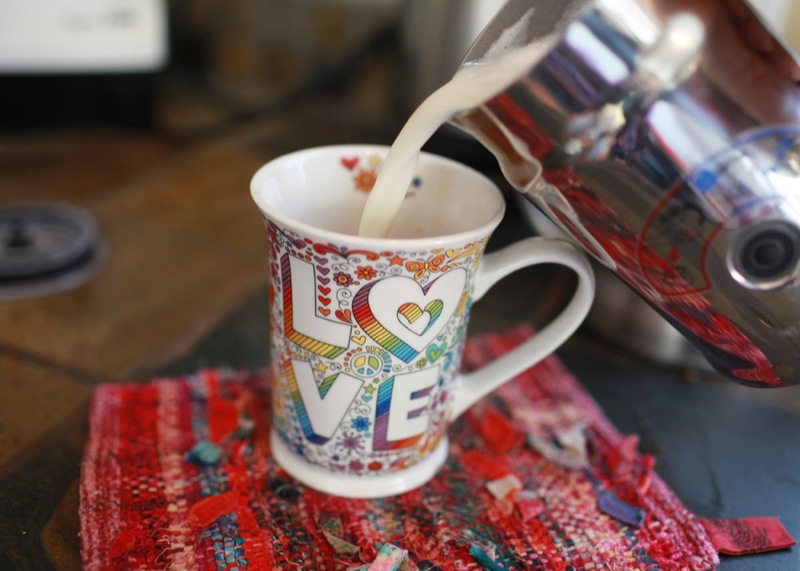 You can choose between frothing and foam...and it works AMAZINGLY well even with almond milk! I like to add a little vanilla Monin syrup! This is my favorite part of the process because I know my latte is soon to be done! 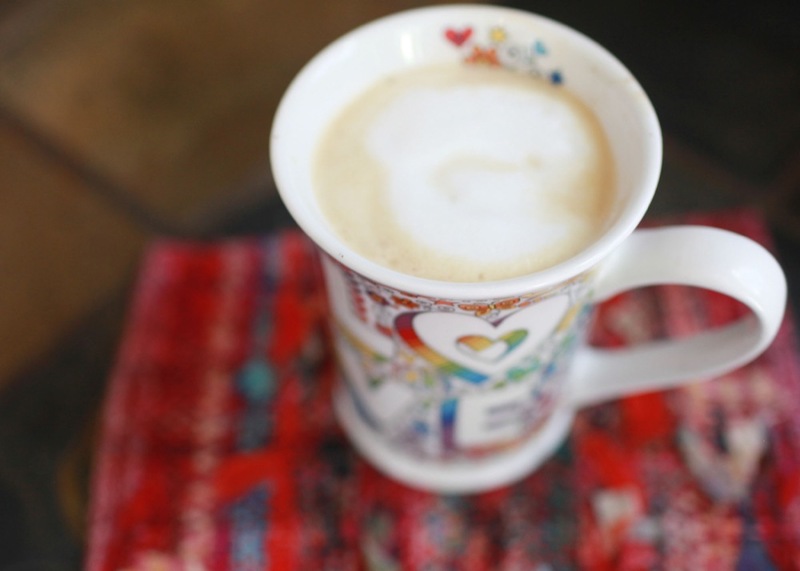 Nothin' prettier than a fresh latte on my mug rug! So good. This process has saved me OODLES of money because I rarely go out for coffee any more! I've found my home roasted beans to be so far superior tasting, that everything else is just...well...bad :) And the frother/syrup fulfills my need for something fancy. Try it for yourself...I know you'll love it! This seems like a lot of steps and somewhat complicated. It's not. Once my hot water is boiled, it takes 2 minutes. 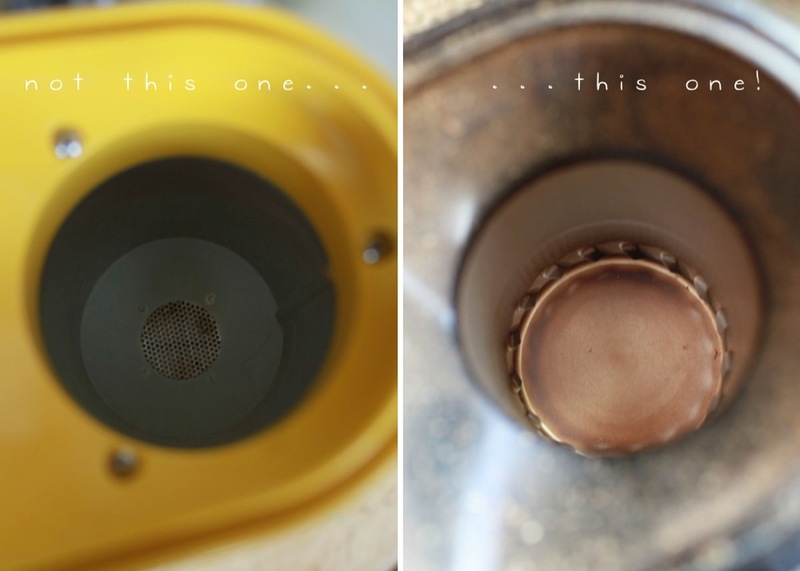 The cleanup of the Aeropress is my favorite part. Just unscrew the lid and "snap" the puck of grounds out into the trash or compost. So easy! Rinse the device and you're done. So much easier than a french press. Experiment! Roasting can be quirky. I got lucky and it worked pretty well on my first try. I think Columbian beans are a good starting point. I have recently started to roast my beans longer than I THINK I should...and they usually turn out perfect. I used to dump them at the first smell of "burny"...but they needed a little extra time. When roasting decaf, they tend to turn dark faster and it's hard to tell when they are done. I recently did a batch and I took them out early and cooled them...and then roasted them a little more to the color I wanted. I have no idea if this is the proper way to do it, but they turned out ok! Joe: The Coffee Book and The Blue Bottle Craft of Coffee. Both have AMAZING photography and are perfect for learning more about all things coffee! Joe focuses on east coast coffee culture, and Blue Bottle is west coast. Another great book is Home Coffee Roasting. I currently buy my green beans from U Roast Em. They always ship very fast...I usually have them within 3 days. I would also like to start ordering from Sweet Maria's. Their variety is mind boggling...and I'd love to try some of their interesting blends. It's so fun to experiment! And so...this has been my coffee roasting and Aeropressing journey. I look forward to my coffee daily! And because I know some of you will ask...I haven't completely abandoned my love of yerba mate! I was just getting burned out and needed something different. I still drink mate occasionally. I can't wait to hear about your own coffee adventures! If you currently roast your own, I'd LOVE to hear your tips. I am such a newbie at this but I love it! **I am not affiliated with any of these companies and I’m not receiving compensation. Just sharing for the love!